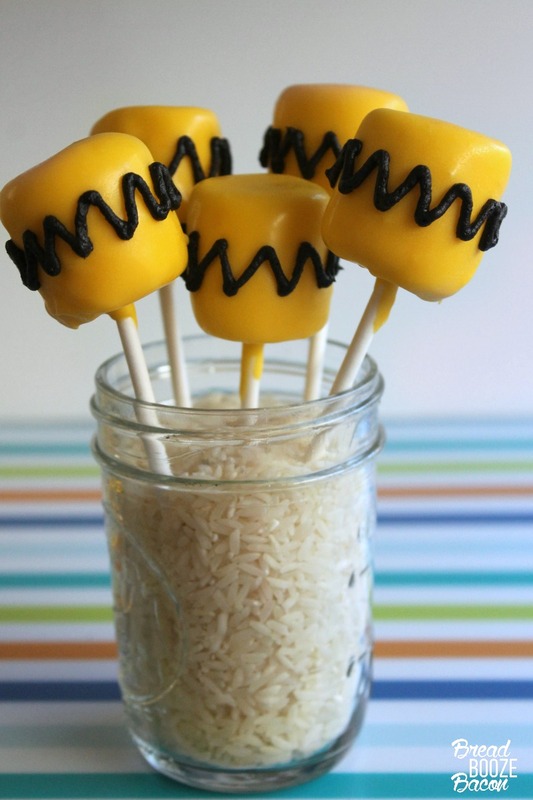 Charlie Brown Marshmallow Pops are a fun treat that’ll bring out the kid in you! 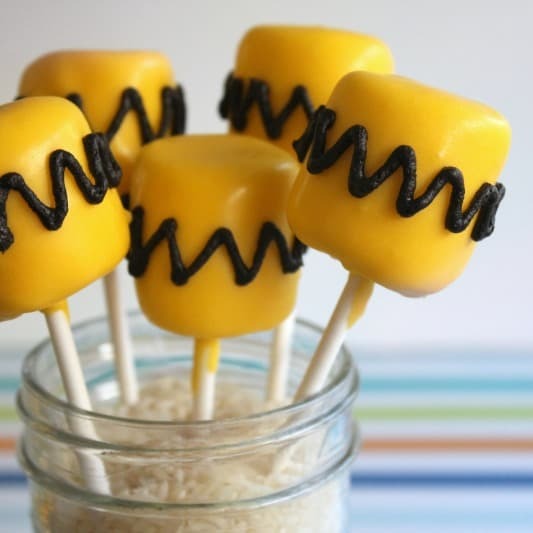 They make the perfect treat for the Peanuts fan in your life! You guys, The Peanut Movie comes out today! My kids have been talking about this movie for weeks…and shaking their little butts trying to do the chicken dance like Charlie Brown. It’s kind of really cute. I’m stoked to take them this week to see it. They’ve been fans of Peanuts for a couple years now. We have all three holiday special and they watch them all. the. time. So when It came time to do something to celebrate the release of The Peanuts Movie I had to do something! I let the boys pick what character I should focus on, and after a Snoopy/Charlie Brown debate, Chuck won out. Then the brainstorming. I was totally going to make cookies, but meh. Then I thought about the boys. They’re constantly asking me for marshmallows (not that I give in) and this would be a super fun way to hook them up. Not to mention with the little squiggle of chocolate on the outside, these pops takes like those amazingly yummy Pinwheel cookies Nabisco makes. You know that ones with the circle cookie (hole in the middle) that’s topped with a big fluffy marshmallow and doused in chocolate?! These pops are that. Minus the cookie. Yeah. Wrap your taste buds around that. If you’re a Peanuts nerd like us, you’re in luck. This month our Blockbuster Bloggers group went all out. Each person picked a different character from the movie to showcase, and made you something awesome to pay homage to their little peanutty faces! I want to make them all and have a big ol’ Peanuts party!! 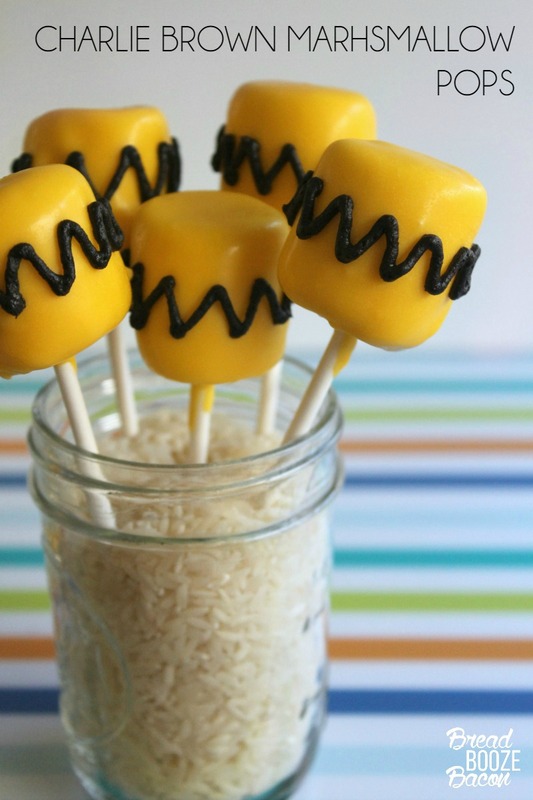 Charlie Brown Marshmallow Pops are a fun treat that'll bring out the kid in you! 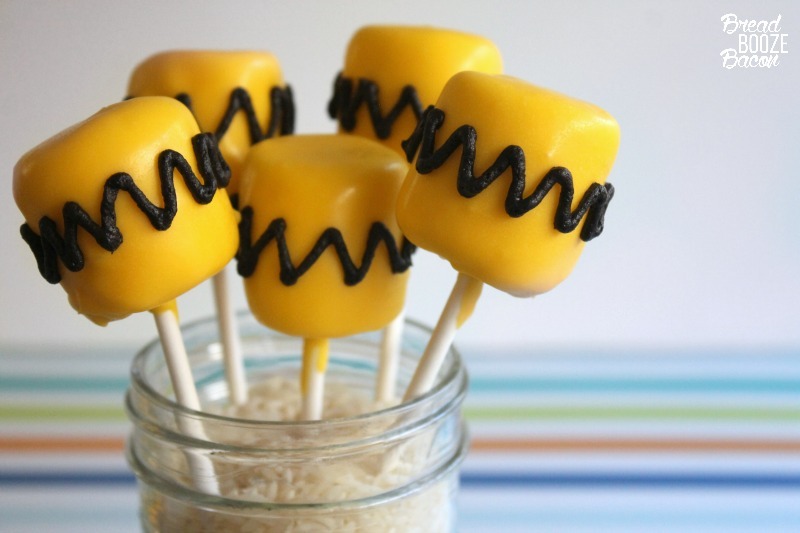 They make the perfect treat for the Peanuts fan in your life! 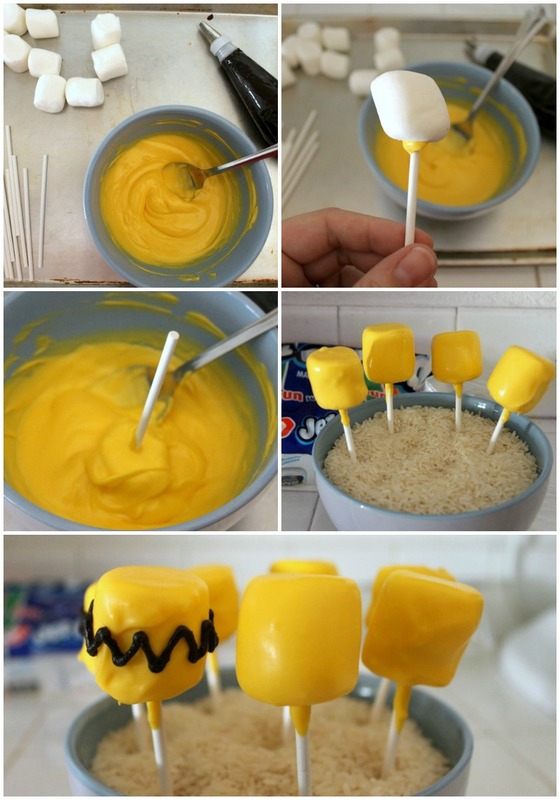 Fill a bowl with rice or popcorn kernels to have a steady place for the marshmallow pops to be inserted into while setting up. Alternatively, line a baking sheet with parchment paper or a silicone mat. This second method may create a little "foot" around the bottom, but if you don't mind I don't mind..
Place the candy melts in a microwave-safe bowl. Heat for 1 minute of 50% power. Stir. Heat again for 1 minute at 50% power and stir until candy will no longer melt. Repeat until the candy melts are completely melted and smooth. Dip the marshmallow into the candy melts, using a spoon to completely over the marshmallow in candy. Lift the marshmallow and tap the lollipop stick on the side of the bowl to help remove the excess candy. Insert the lollipop stick into the bowl of rice to hold the pop upright. (Or place the pop, marshmallow down, on your prepared baking sheet.) Repeat with the remaining pops. If the candy starts to thicken too much, heat it for 20 seconds at full power and stir. Transfer the pops to the refrigerator for 5 minutes to set the candy. While the candy sets, fit your piping bag with a coupler and piping tip. Fill the bag with dark chocolate frosting and squeeze the frosting down toward the tip to remove any air bubbles. Remove the pops from the fridge, and one at a time create the signature Charlie Brown zig-zag line around the middle of the pops with your frosting. While you pipe, use the lollipop stick to rotate the pop so you can keep piping all the way around in one shot. Return the pop to the bowl, and repeat the frosting on each remaining pop. Refrigerate until ready to serve. I made a half batch of chocolate frosting to decorate, and had WAY more than I needed for 12 pops. So plan on making some cupcakes or something to go with the frosting. Or eat it with I spoon. I won't judge. 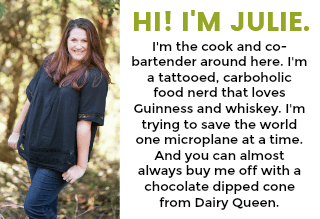 These are so much fun – and recognizable right off the bat!